In my recent hummus post, I talk about the surging popularity of that tangy, chickpea based mezze. I often wish that Baba Ganoush (or Baba Ganough, or any of the other possible spellings and names for this dish) would see a similar rise in popularity. It has many of the same flavors – tahini, lemons, and olive oil. However, instead of the calorie dense base of mashed chickpeas, there is a base of slightly sweet / slightly bitter roasted eggplant with almost no calories. By the way, in the video I mistakenly say that baba ganoush is the Greek pronunciation, and baba ganough is the Turkish way to say it. That seems to be wrong, and I didn’t mean to offend anyone. Those are both alternative spellings of the same Arabic name. Many years of seeing the same dish on Greek menus spelled ganoush and Turkish or Lebannese menus spelled ganouj or ganough led me to interpret that pattern wrong. 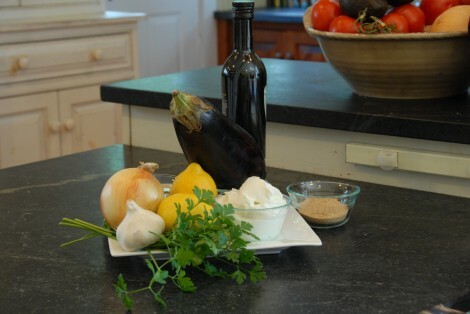 According to Wikipedia, the actual Greek name is melitzanosalata (the romantic and fanciful ‘eggplant salad’). However, all of the times I have ordered melitzanosalata it is a different dish, and I have seen both baba ganoush and melitzanosalata on the same Greek restaurant menu before. I hope that clears things up. Regardless of what you want to call it, some sort of eggplant salad is eaten across much of the world. The version I present below is a lemony, tangy version with a bit of yoghurt added to both smooth it out and provide some of the tangyness. It also includes a little cumin, which may make it a bit more Armenian styled – but I got the idea from a Moroccan book…. anyway, it’s great. Pierce the eggplant multiple times with a knife or long skewer. Place on a sheet pan, and roast for about 1 hour, until the eggplant looks a bit deflated and is soft to the (oven gloved) touch. Remove from the oven, and allow to cool until it is safe to handle – at least 45 minutes. Remove the skin from the eggplant, making sure to reserve as much of the pulp as possible. Roughly chop the eggplant and add to the bowl of a food processor. Add the tahini, and garlic and process until smooth. Add the onion, bread crumbs, lemon juice, yoghurt, cumin (if using) and a teaspoon (5 ml) each of Kosher salt and fresh ground pepper. Process until the onion is finely diced and incorporated. Taste, and add salt, pepper, cumin, or lemon juice as desired. Pulse to blend. Finally, as the last ingredient add the flat leaf parsley and just process until incorporated. 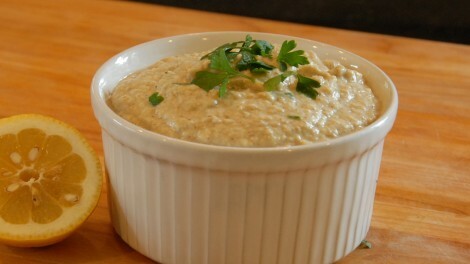 Plate the baba ganoush, and garnish with more parsley, a bit of olive oil, some Spanish smoked paprika – your choice.